Fruit trees often set more fruit than they can support or develop adequately. Excessive fruit compete with each other for food and remain small. Leaving too much fruit on a tree can also lead to limb breakage. To avoid this, fruit thinning is recommended — that is, removing some of the developing fruit. The main benefit of thinning is that it lets the fruit receive more sunlight. This improves color and flavor and allows the fruit to develop to its maximum size. All stone fruit (peaches, apricots, nectarines, cherries, and plums) require thinning. All apples, pears, and Asian pears also need thinning. Fruit should be thinned when they are fairly small — typically April to mid-May. There are two main ways to thin fruit: by hand or by pole. Thinning by hand is more thorough, but pole thinning is faster. Hand thinning involves removing enough fruit to leave the remaining fruit with sufficient space so they do not touch at maturity. Use your fist as a spacing tool and remove the excess fruit. Remove “doubles” (two fruit fused together) and small, disfigured, or damaged fruit. Pole thinning is primarily used on large trees where hand thinning is impractical. Pole thinning is much faster, and although it is less accurate, the results are often acceptable. Apples: Thin by hand within 30 to 69 days after full bloom to about one apple per 6 inches of shoot growth. Apricots: Thin fruit to about 4 to 6 inches apart when 1/2 to 5/8 inches in diameter. Nectarines: Thin fruit to about 6 inches apart when marble-sized. 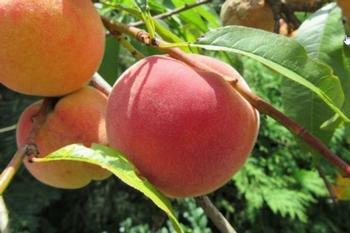 Peaches: Thin fruit to about 6 inches apart when marble-sized. Pears: Thin pears to 6 inches apart if crop is heavy. And good news for citrus tree growers: no thinning is recommended!